Birdwatching is a harmonious recreational activity which involves observing wild birds in their native habitat that can be enjoyed by everyone. It can be done with the naked eye, through binoculars and telescopes, or by listening to bird sounds. There are a number of reasons to participate in this activity, for some it is the thrill of the chase, or racking up a long list of bird sightings. Others are just content to get to know a few of the common birds and few do it as a profession to help in their conservation, but most birders say that they simply enjoy the opportunity to go outside, learn about nature, and spend time with people who have like interests. Whatever your inclination, it is knowing in the fact that you are doing something fun, worthwhile, productive and positive. Due to their accessibility and ubiquity, birds are a useful tool in environmental education and awareness of environmental issues and the research and conservation effort done by the Heart of Borneo initiative plays an important role in promoting conservation awareness to the public. Birds easily transmit values in respect for nature and the fragility of ecosystems for moulding a sustainable future. Brunei is a home to one of the most pristine rainforest in Borneo and home to around 622 species of birds, of which 49 species are endemic only to Borneo, making Brunei rainforest as one of the most species rich habitat in the world. Here thousands of species of plants and insects abound, together with a further array of hornbills, barbets, babblers, sunbirds, spiderhunters, leafbirds, trogons and floor dwellers like pheasants, pittas and wrenbabblers. Other important areas are the coastal and riverine, that include fresh water swamps and mangrove forests. These places are crucial for the survival of species such as the threatened Storm’s Stork, Lesser Adjutant, Cinnamon-headed Pigeon, Borneon Ground Cuckoo and Straw-headed Bulbul. 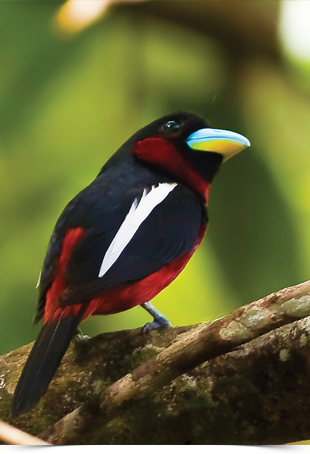 Other birds such as the Ruddy Kingfisher and the Hook-billed Bulbul depend on the health of the mangrove forest. These include the Brunei River, Seria River Estuary, Belait River, Tasek Merimbun, Luagan Lalak and Temburong River. Prime wildlife viewing hours for most species are the first few hours of daylight and the last few hours before sunset as the birds are more active and vocal making them easier to spot. Although hawk-watching, one of the most exciting wildlife-watching events, is frequently best enjoyed during the middle of the day. The procedure for nocturnal, or night-active animals doesn’t get going until after the sun goes down. In the Brunei hillsides, bordering the Malaysian state of Sarawak, birds are quite common, though the logistics of getting to some of the areas are tough, especially during the monsoon season. Birdwatching in Brunei is a part of ‘in Brunei’ series produce by Syensai with the support of Bruneions.com for Brunei Tourism Board. 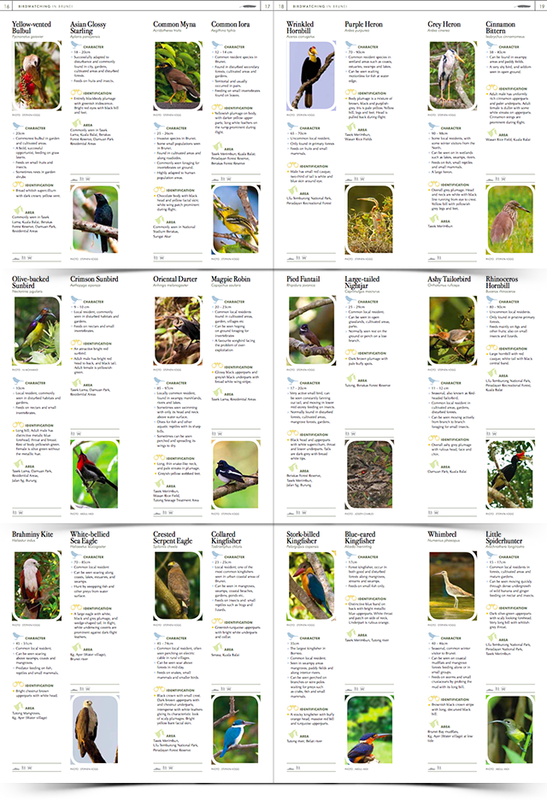 The information and selection of bird species is provided by the Heart of Borneo team. The species selected for this booklet are those that are commonly sighted and the list of areas that are easily accessible for birders. Click here to view the booklet in Scribd.